We had a water play session at school today. And boy, was it fun! Me and Timothy had buckets of fun, pouring water everywhere. 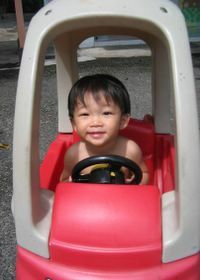 Too bad one of the 3 musketeers, Dylan, was sick... so he on MC, cannot come. 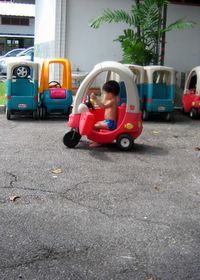 But after a while, I got tired of the water and I just wandered off to drive in one of the toy cars. kekeke... yah, me very zi dong one.